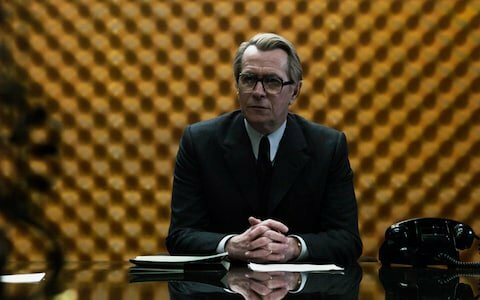 ‘Tinker Tailor Soldier Spy’ is known for its thoughtful style. The question is, how is this critically acclaimed thriller so gripping whilst so slow-burning? Tomas Alfredson’s spy drama has a thick atmosphere. There is something intoxicating about the ponderous mood, like the director is snake charming the audience. Most of the main plot revelations occur in scenes that, in terms of staging, involve two men sitting in a room. Despite the apparent lack of action, accusations are being thrown; wars are being fought and discoveries are being made in the subtext. There is a universe beneath the surface. You could watch this film two hundred times and find something new each time. Despite the dense and serious nature of the film, certain lines and moments are quite theatrical. For example, a character is heard asking for a favour, as a voiceover while it is done on-screen. These narrative beats works as markers for the audience, indicating a big plot development and add to the uncanny, strange tone. The soundtrack from Alberto Iglesias is as sweet and soothing as syrup. It trickles over every scene, infused with noir influences. The score creates a heady and moody ambience. The sets are exquisitely designed. Alfredson creates a microcosmic little world, a snow globe of a time period. He relishes rolling the camera around it, emphasising the drama in its curves and edges. Even the finale is understated. However, multiple arcs are wrapped up, the instruments crescendo together like an orchestra. Despite its patient pace, ‘Tinker Tailor’ holds our attention by capturing a fascinating world and an addictive sensation.